Sarah competed in her first triathlon in St. Louis, MO in June of 2003 upon college graduation and became a professional triathlete less than a year later in May, 2004. While in college, Sarah competed in cross-country and track at the University of Tulsa. She has a degree in Elementary Education and a minor in Mathematics. Sarah grew up in St. Louis, MO and began swimming at a very young age. She swam on the Parkway Swim Club and ran cross country and track in high school. Sarah was a Missouri high school state champion in cross country and swimming, while attending Parkway South High School. Sarah thoroughly enjoys teaching and coaching children and adults of all ages about the benefits of health and exercise, as well as teaching the skills of swimming, biking and running. 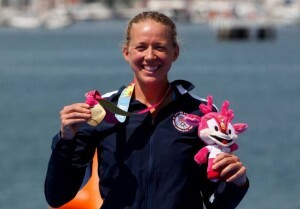 In December of 2006, Sarah married Nathan Kortuem, who is now her current coach and training partner. Sarah and Nathan have a fiver year old daughter Caroline, and a 1 year old son Connor. They reside in Eureka, Missouri.